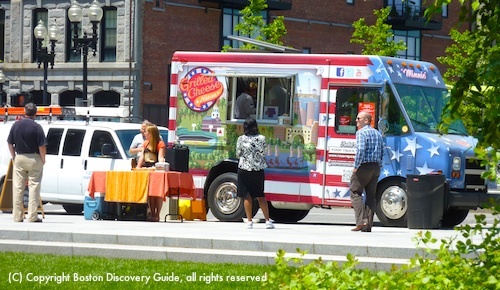 You'll want to learn more about Boston food truck locations as soon as you taste the mouth-watering treats from their kitchens on wheels - because knowing where to find the trucks is your key to enjoying more of their cuisine. Within Boston, city officials control where the food vendors can operate by designating locations and time slots for the food trucks. Sites typically offer 3 meal shifts - breakfast (6am to 10am), lunch (10am to 3pm), and dinner (3pm to 9pm or 11pm, depending on the site). The food trucks rotate among the officially designated spots, so you'll find plenty of variety, even if you go back to the same place every day. Most food trucks park at their sites from Monday through Friday during spring, summer, and fall. Far fewer show up on weekends or during winter months. 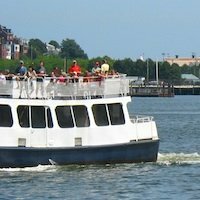 You can also visit food trucks at SoWa Open Market, local food truck festivals, and other special events. What, Exactly, Is a Food Truck? 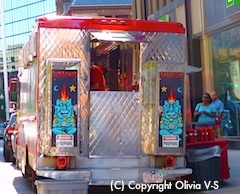 According to the City of Boston, a mobile food truck is a large vehicle, usually 24 feet long and 8 feet wide, with a complete commercial-size kitchen where food is prepared, cooked, and served through one or more windows in the side of the truck. Why Can't Food Trucks Park Wherever They Please? Have you seen our streets? Most are so narrow, especially with vehicles parked along both sides, that they barely accommodate one or two lanes of cars! 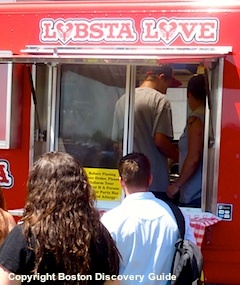 Plus, there are rules about trucks offering a particular type of food - say, lobster rolls - not parking within a certain distance of restaurants featuring the same cuisine. Seems fair - after all, we love our restaurants too! By design, the food truck schedules rotate locations, so that the same truck will not usually be in the same location for two days in a row. This policy actually provides an incentive to try the cuisine at lots of different trucks. Want to know which truck will be a specific location on a certain day? Best way to find this out is to go straight to the source: the City of Boston, which does the scheduling. In addition to the city street locations, trucks also may park on private property - so look for more trucks near universities, hospitals (in particular, in the Longwood medical area), and business parking lots. Sure, you'll find Boston's food trucks in lots of locations around the city. But what if you want MORE? From May until the end of October, you can visit as many as a dozen food trucks at SoWa Open Market - also a great place to browse, shop, and wile away a Sunday afternoon. Food trucks have also been showing up at special events and celebrations around the city - so look for them where large groups of people are likely to congregate. During these events, they typically park in the food truck locations described above, since those tend to be areas large enough for them to park without choking off Boston traffic. Dine Out Boston! - Twice a year, Boston's best restaurants go on sale...don't miss this opportunity to dine for less!